The thrill of rising sap, the delicate aura of ripening, the extravagance of an indomitable force animating the particular and the universal, propelling the one and many in an ancient cycle. And now there is a blue lilt to the air, a gauzy greenness an unmistakable shimmer that runs through the days. (I have lived the taste of this before in another time and place — but when and where?) Just around the bend in the road lies that fairytale ball, Spring. Every blade, every branch, every blossom in the kingdom is invited. Who can resist such excitement? See how the world readies itself for festivities with ribbons and jewels. Young oak leaves unfurling from tight casings hypnotic green, camellias tossing ruffled candy pink skirts, queenly irises yawning purple and gold, tremulous tulips breaking like dawn, jonquils and daffodils nodding dainty heads, straight-backed lavender spearing the air, starry faced jasmine bursting out of sharp-tipped buds, brilliant poppies catching sunlight like a lucky penny, wisteria with its tumbling grape-like clusters scenting the world with wisterious allure. I stumble amidst the incandescent beauty of this neighborhood in the hills. These domestic paths so familiar and full of wild surprise. I am taken by the paradox of this spontaneous orchestration. And its grand scale! The thrill of rising sap, the delicate aura of ripening, the extravagance of an indomitable force animating the particular and the universal, propelling the one and many in an ancient cycle. And why does this feel both searingly new and hauntingly accustomed? How we floated through that time and space like dust motes, like winged seeds, like dragonflies, in a ray of sunlight. Gleaming with energies that arced far beyond our single selves, charged with prolific dreams, and inchoate ideas, untethered potential. One night I wake from a dream and the darkness is a riptide of memories that pulls me back to the wide staircase of a convent college on Cathedral Road in a seaside city in Southern India. If you do not know it it does not matter. If you do, then you know how we streamed up those stairs like an improbable river of flowers, a river of stars. With our books and our timetables, our handwritten notes, our unruled foreheads. How we sat on the wooden benches of higher education as the world rained down upon us. How our minds broke casually into blossom. How we thrived on canteen samosas, coffee and conversation. The sky a brilliant blue tent of possibility. The future a languorous cat. This life an all-absorbing romance. How we floated through that time and space like dust motes, like winged seeds, like dragonflies, in a ray of sunlight. Gleaming with energies that arced far beyond our single selves, charged with prolific dreams, and inchoate ideas, untethered potential. How we lived that springtime of our lives unbeknownst to ourselves with such dazzling perfection. Another springtime beckoning. And who can resist such excitement? And now we are where we are, scattered across the world wrapped in cherished roles, older yes, wiser perhaps, another bend in the road before us. Another springtime beckoning. And who can resist such excitement? Only those who overthink it. The flower is always the bud’s undoing. Let go then. Step into the river lean into the wind let the strength of the earth rise through you. Watch your fingertips burst into bloom. 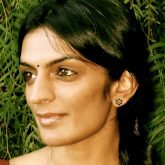 Pavithra Mehta is co-author of the book Infinite Vision: How Aravind Became the World’s Greatest Business Case for Compassion. She volunteers with ServiceSpace, and is co-editor of its news portal, DailyGood. Dear Pavithra, thank you for this very beautiful, poetic exhortation. Your images and words are music for the dance of celebration with the coming spring. May we all dance. Dear Pavithra, I don’t know english language so well as to understand every word, but I allow myself to be carried away by the music of this wonderful poem. Thank you. Dear Pavithra, your reflection touches the heart and soul, it is beautiful! Yes, Springtime is so magnificent and miraculous! When I saw the first robin of Spring a week or so ago, I was filled with joy! It makes one contemplate about the one loving energy that is the Cause of everything. All this beauty given to us, moves one to near tears. Thank-you for sharing your beautiful reflection!